Floë Induratec 636 competition winners! 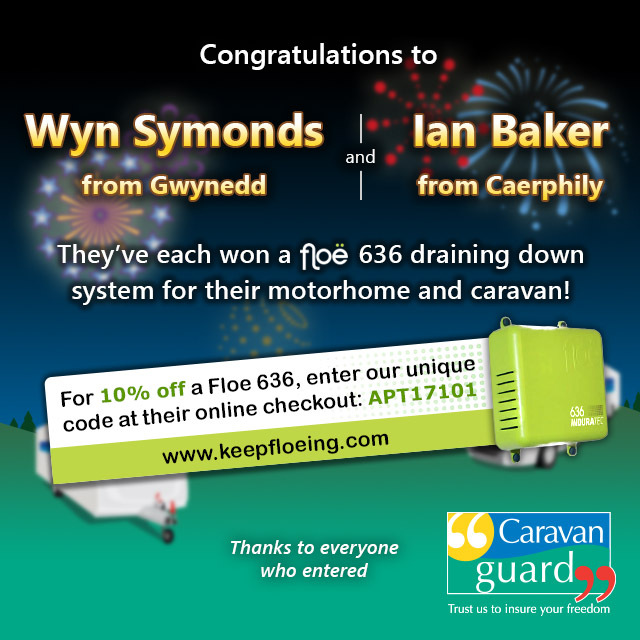 Thousands entered our giveaway competition to win a Floë Induratec 636 integrated drain down system for a caravan and a motorhome. Congratulations to our lucky winners – Wyn Symonds from Gwynedd and Ian Baker from Caerphilly in Wales. Those systems are on their way to you so you can drain down your leisure vehicles for winter. Thanks to everyone who entered and remember if you want a Floë Induratec 636 integrated drain down system we have a 10% discount code for our readers – just in time for Christmas! Simply enter the unique code APT17101 at their online checkout before December 31st, 2017. For more information about the system and other products from Floë visit www.keepfloeing.com. You can also read more about Floë Induratec 636 in our recent article. *10% Floë discount code only applies to the Floë Induratec 636 water drain down system and does not include other products or accessories. Offer code expires midnight December 31st 2017.